Print quality issues like lines and smears can easily be eliminated by this quick step. The tools are built-into the device – so, all you need to do is to pull and push back a lever. This step is applicable for all the units in the Xerox 7800 series including the Xerox WorkCentre 7830, 7835, 7845, 7855 and the new “i” series Xerox WorkCentre 7830i, 7835i, 7845i and 7855i. 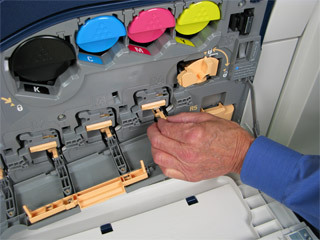 Th printer is constructed with four print-head lenses on the drum. Clean all lenses as described in the following procedure. 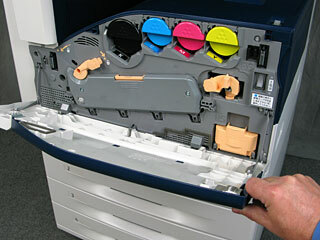 CAUTION: Do not perform this procedure when the printer is copying or printing. Turn the orange lever to the left. 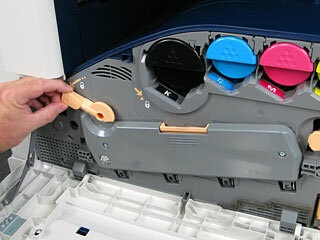 Pull the Drum Cartridge Cover down until it clicks into the open position. 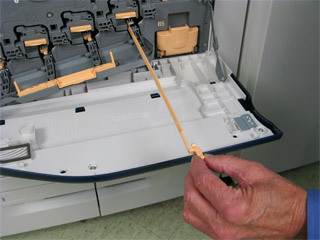 Each of the four printheads has its own cleaning tool. Slowly pull the printhead lens cleaner out until the three dots are visible. 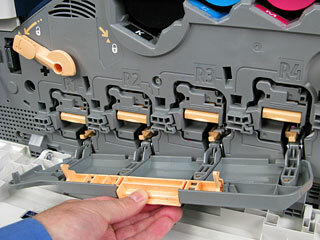 NOTE: The printhead lens cleaner does not detach from the printer. 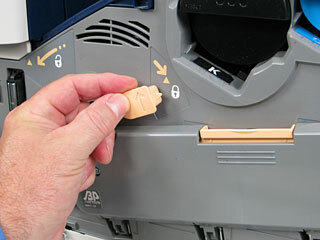 Slowly push the printhead lens cleaner back into the printhead until it stops. 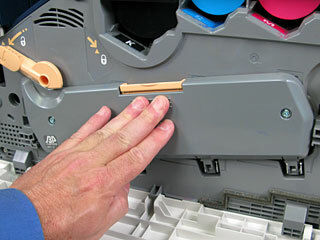 Repeat steps 4 and 5 for each printhead. Close the Drum Cartridge Cover. Turn the orange lever to the right to return it to the locked position.